Thallus: foliose, up to 2-3(-4) cm in diam., irregular to more often orbicular lobes: usually +linear and discrete to crowded and overlapping, 0.1-0.5(-1) mm broad, +flat to weakly convex, prostrate upper surface: tawny gray to gray-brown or brown, epruinose but occasionally developing a patchy epinecral layer in some parts, without soredia or isidia but sometimes developing irregular sparse to rather abundant lobules upper cortex: paraplectenchymatous medulla: white lower cortex: paraplectenchymatous lower surface: black, sometimes paler at the lobe tips, dull to weakly shiny; rhizines: simple, black Apothecia: frequent and usually present, up to 0.9 mm in diam., sessile; margin: entire or more often becoming irregularly crenate or even lobulate, sometimes with a corona of rhizines ascospores: ellipsoid, 16-23(-27) x 8-10.5 µm, Physcia-type Spot tests: all negative in cortex and medulla Secondary metabolites: zeorin. Substrate and ecology: usually on rock, occasional on mosses over rock World distribution: North America, Europe, and eastern Asia Sonoran distribution: mountains of Arizona, southern California, and Baja California. 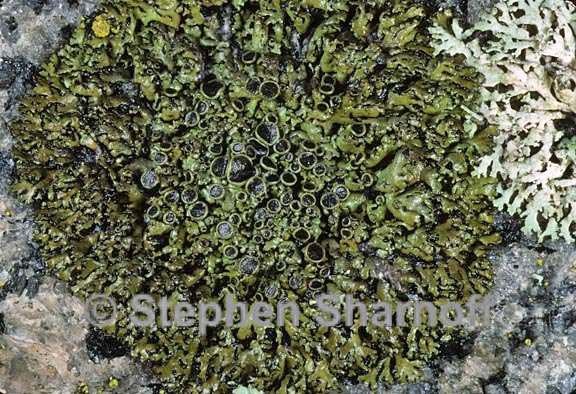 Notes: Phaeophyscia decolor is distinguished by its narrow lobes, brownish color, white medulla, and almost consistent occurrence on rocks. The species is most likely confused with P. sciastra, that usually is distinguished by the presence of at least sparse isidia. Very small, poorly developed or badly treated specimens can be especially difficult, although, if there is adequate material for a chemical analysis, P. sciastra can be distinguished by its lack of significant amounts of zeorin. Fragmentary specimens too small for chemical analysis may not be determinable with certainty. Although this species is submerged into P. endococcina by Moberg (1977 & 1995), in western North America all specimens with a pigmented medulla have Pachysporaria-type spores and are clearly distinguished from P. decolor.